Because sometimes you really want meatloaf on a weeknight, but you don’t have time for the traditional loaf to bake for over an hour. Grab ground beef, bell pepper, onions, fresh herbs, eggs, and Dijon mustard for this local foods based recipe. Packable, portable meatloaf, and did we mention quick + easy? Preheat oven to 400 degrees. Spray 9 compartments of a muffin pan with nonstick cooking spray. Cut parchment paper or aluminum foil into 2″ wide strips and place one strip into each of the 9 muffin cups. In a large bowl, combine the meatloaf ingredients, being careful not to over mix. Divide the meatloaf mixture into 9 equal portions – I find a 1/3 cup ice cream scoop comes in very hand for this. Place the portions into the prepared muffin pan, leaving each one domed on top. 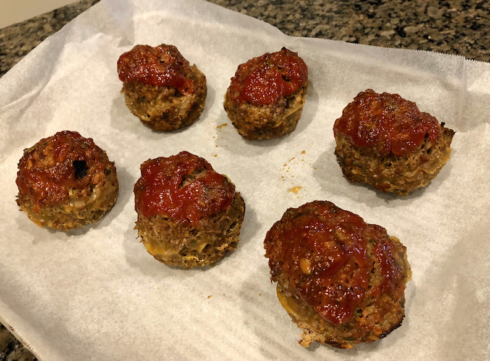 In a small bowl, mix the glaze ingredients, and brush over the meatloaf muffins. Bake for 20 – 25 minutes, or until cooked through. Allow to cool for about 5 minutes before using the strips to lift out of the pan. If you have leftovers, you put them on a parchment lined pan and freeze (as shown in the photo above) – freezing them separated will prevent them from being stuck together and the glaze won’t stick to the container. Once completely frozen, you can either transfer to a freezer bag, rigid container, or vacuum seal them. If vacuum sealed, they’ll keep for about 9 months. If stored in a regular freezer bag or rigid container, they’ll keep for about 3 months. These also pack well for lunches! Previous PostIFC Distribution is Today; Farmers’ Market @ Franklin!